Portico, an Italian word that essentially means "a porch cover with columns," has become an increasingly popular home addition throughout the U.S. With so many homes built in the colonial style, Northern Virginia is a particularly popular area for porticos and covered/screened porches. 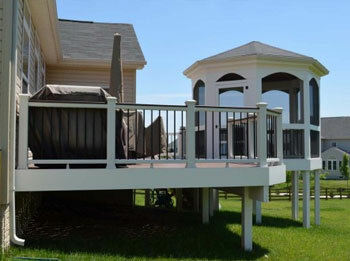 Mark Shriner Contracting, also known as Distinctive Deck Designs, has more than two decades of experience in the industry and has designed and constructed some of the finest porticos and porches for homeowners in Virginia. Unique and functional porticos and porches from Distinctive Deck Designs add value to your property while at the same time delivering a stylish and elegant look that will make you the envy of your entire street. Our portico, covered porch and screened porch designs are made from high-quality, low-maintenance materials. We work diligently to make certain that every customer is satisfied with the final outcome. We will complete your installation in a timely, courteous, cost-effective manner, and we always ensure that we keep you up-to-date every step of the way as your construction project unfolds. Our deck builders will listen to your ideas and take the time to understand your vision and examine whether your existing concrete stoop will support a new portico construction. After, we will offer helpful, practical suggestions related to current design trends, building codes in your neighborhood, your return on investment, and the timeline of the project itself. Please note that a building permit is required for the construction of porticos in Fairfax, Arlington, Prince William, and Loudoun County. 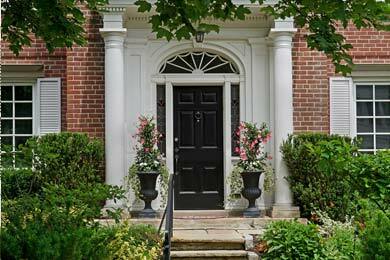 Porticos and porches are the perfect addition for any home. Distinctive Deck Designs is proud to be THE go-to construction company thanks to our competitive pricing, world-class designs and passionate staff. We look forward to working with you to create the portico or porch of your dreams! Call 703.263.9634 or contact us online today for a free design consultation. Our licensed contractors serve Fairfax, Burke, Chantilly, Woodbridge, Springfield, Aldie, Clifton, and all of Northern Virginia.